The moral of this story… START SLOW! | 5-6-7-8 Dancing My Way to a Healthy Me! The moral of this story… START SLOW! The next day I went to the doctors office for a checkup and to get my prescriptions renewed. Wednesday, I could barely walk. And today, yeppers you guessed it, I can barely walk. Walk? I can barely sit. At the doctors office I think I pulled a muscle in my lower abdomen sitting up from lying down on the exam table. 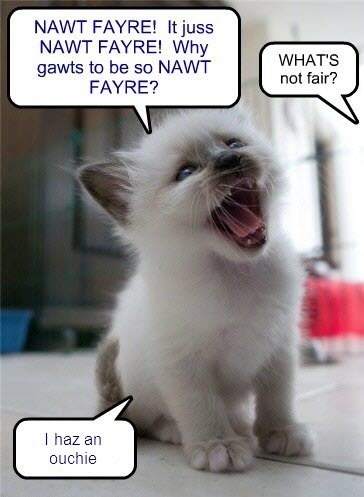 And it is NAWT FRIGGIN FAYRE!!!!! There is nothing for it but to let the muscle rest and repair itself. The thing that really stinks about this is that the “injury” came when I wasn’t being careful. On my two walks I was “aware” of my poor fitness level and I was very careful to not push too hard. BUT in the doctor’s office I just sat up too quickly and put too much stress on the muscle. (Yes, I’m THAT out of shape). Hopefully things will be better by Monday and I’ll be able to continue walking. If it isn’t I’m going to call the doctor and make an appointment to make sure that it really just is a muscle pull and not something more serious. The moral of this story… when you are VERY out of shape, every movement should be carefully planned and considered. Do not overexert yourself by going too fast too soon or you’ll risk injury. And when you are as out of shape as I am at this moment, even “routine” movements need to be treated as exercise and approached with the appropriate respect. Posted on Sat, May 10, 2014, in Misc and tagged go slow, muscle injury, muscle soreness, starting a. Bookmark the permalink. 3 Comments. Keep your chin up buddy! I love your persistence. I was just wondering,if you’re doing a stretching routine after your walk? If not, mIght I suggest something? When you embark on an exercise program, what some people don’t realize is that ,stretching afterwards is just as important as the activity itself (at first, it’s more important!). I know this from experience. When I started exercising my stretching routine actually increased my heartrate. And once my body was conditioned to it, the results were amazing! You could even start with neck and arms while your abs are healing (doing it sitting down!). And yes, it will be exercise! I forgot to stretch afterward. I was so happy with just finishing that I neglected to do that and it probably contributed to the strain. Well… lesson learned the hard way.